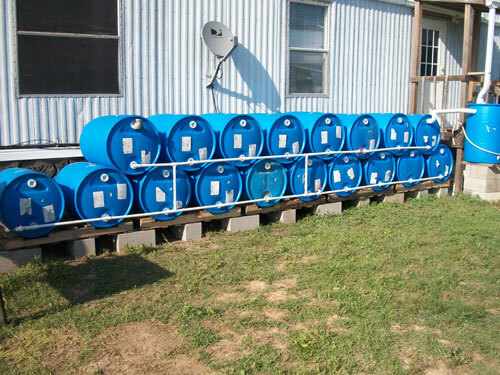 Investing in a rain catchment system can provide you and your family with an independent source of clean drinking water in the event of an extended drought or disaster that eliminates access to usable water. Earthquakes, terrorist attacks, devastating tornado outbreaks and drastic climate changes could potentially interrupt the flow of decontaminated water we take for granted whenever we want a drink, a bath or a home-cooked meal. While the human body may survive for several days or longer without food, it cannot endure more than three to five days without water before suffering severe medical issues and eventual death due to dehydration. One way to implement a rain catchment system is to collect rain as it runs off sloping roofs. Because this type of water is likely polluted with bacteria and debris, it will be necessary to treat the water before using it. Underground or aboveground vessels used to catch water runoff from roofs can be as small as a jar or as large as a metal tank. Pipes are connected to gutters to divert the water flow into the containers for maximum efficiency. However, the amount of rainwater collected from a roof depends on the roof's material. Aluminum, slates and tiles provide the best type of roof material with which to catch a reasonable amount of rainwater. Roofs coated with a protective substance may give the water an undesirable color or taste. Additionally, certain chemical coatings could cause the water to be totally unusable even after purification. Keep trees trimmed away from roofs when using this system for rain catchment. This will prevent bird and other animal droppings from contaminating the water. Clean gutters frequently, washing and rinsing them. Cisterns used for collecting rainwater should be in excellent condition, crack-free and airtight. They should also be black, brown or other dark color to prevent algae proliferation due to infiltration of ultraviolet rays. In weather conditions consistently below freezing, rain catchment vessels need to be insulated so water does not freeze. Water used for gardens may not need filtering or decontaminating. However, water provided to livestock requires the same decontaminating procedures needed to purify water for human consumption. Make sure the rain barrels are placed on a level surface, usually a couple of feet off the ground. This allows you to place a bucket below a spigot to obtain water from the barrels, or to affix a hose and have enough gravity to force water through it to use when watering a garden. You can elevate the barrels using cement blocks with pallets, or even pressure-treated lumber that you use to build a sturdy platform. Empty barrels are lightweight and easily tipped over before they are filled. Consider securing the barrels to the building, perhaps using an old garden hose. Use it as a strap to wrap around each barrel, and then a screw to attach it to a wall for support. All containers used in a rain catchment system should be tightly covered, especially around the opening where piping enters the container. Mosquitoes possibly carrying diseases are attracted to the water during warm weather, as well as other insects during drought conditions. Boiling, filtering, adding bleach or using purification tablets accomplishes thorough decontamination of rainwater. For filtering water to eliminate sediment, you can use paper towels, coffee filters, or cheesecloth. After pouring rainwater into a pop bottle, stick a thick cotton plug into the opening and drain the water into a clean cup. Boil water for at least three to five minutes to kill toxic microorganisms before drinking. Treat one quart of mildly cloudy water with three drops of chlorine bleach. Treat one quart of very cloudy water with five drops of chlorine bleach. Place 1/8 teaspoon of bleach in one gallon of rainwater. Groundwater catchment arrangements utilize not only rainwater but also run-off from streams or lakes. The system involved is more complicated than roof catchment systems but can provide more water in times of scarce rainfall. Increasing the slope of the land as well as clearing vegetation may also increase the amount of water collected. Additionally, physically compacting the soil by using rollers and graders will reduce erosion rates and facilitate surface runoff. Implementing a rain catch-ment system that provides a lifesaving and cheap form of water resource can rectify survival situations in which clean water is scarce or totally inaccessible.